For decades, politicians and pundits have claimed that recognizing Jerusalem as Israel's capital would destabilize and further radicalize the Middle East. Two months after President Trump signed the order to move the embassy, however, the Palestinian Territories are relatively calm. Although there were some initial protests in Gaza and the West Bank, a mass uprising in the Palestinian Territories seems highly unlikely. So where are the extremists that we've been warned about for so long? One need look no further than Turkey and its web of proxies. 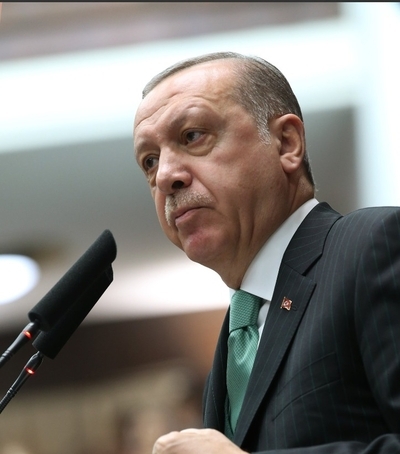 Facing setbacks in his foreign policy and popularity, Turkish President Recep Tayyip Erdoğan has attempted to better his image in the Muslim world by spewing extreme anti-Israel rhetoric. Protests in both Turkey and America, meanwhile, have been organized by Islamist organizations closely tied to the Turkish regime. On January 28, the Turkish government hosted a conference in Istanbul to discuss "Palestinian rights" to the city of Jerusalem and to showcase "coexistence and solidarity with the Palestinian people." Along with Turkish government officials and members of the Turkish Prime Minister's family, a number of extremist clerics attended, including Muhammed Asri Zainul Abidin, a Malaysian preacher who has previously claimed that Hitler "might have been right" to exterminate the Jews. Also in attendance was Sami Al-Arian, a prominent Islamist who was deported from America in 2015, and had previously pleaded guilty to raising money for the Palestinian Islamic Jihad (PIJ) terror group. Al-Arian told conference members in Istanbul that America "is our enemy." In Turkey, protests against America and Israel have been championed by a government-backed Turkish NGO named the Humanitarian Relief Foundation (IHH), which organized a 20,000 strong protest at which crowds chanted: "Fight, Jihad, Martyrdom!" The IHH, which is supported by Erdoğan's Justice and Development Party (AKP), helped to organize and sponsor the 2010 Gaza flotilla,during which the Israeli military intercepted and boarded ships attempting to break the Israeli blockade on the Gaza Strip. Such IHH "activism" is not surprising, given its leadership's extremist views: at a funeral for Chechen terrorist Shamil Basayev—who murdered over a hundred children in a terror attack at a school—IHH Chairman Bülent Yıldırım honored Basayev and led the prayers. The tribute to Basayev is still featured prominently on the IHH's website. Turkish Islamists linked to Erdogan are not, however, just marching in Ankara. In December, the D.C.-based non-profit Turkish American National Steering Committee (TASC) helped organize a large protest outside the White House in collaboration with a number of American Islamist groups. Photos of the rally show huge banners proclaiming a "red line" on Jerusalem—the exact words Erdoğan had used against Trump's declaration, only a few days earlier. TASC does not hide its history. It previously sponsored a pro-AKP rally to show support for Erdoğan during the alleged coup in 2016. Originally formed to lobby against American recognition of the Ottoman Armenian genocide, TASC has also celebrated recent UN resolutions denying Israeli claims to Jerusalem and declared Jerusalem "the capital of Palestine." Even non-Turkish Islamist organizations in the US have developed close ties to Turkey and Erdoğan's regime. Co-sponsors of TASC's protest against the recognition of Jerusalem as Israel's capital included the Council on American Islamic Relations (CAIR), the Muslim American Society (MAS), and the Islamic Circle of North America (ICNA)—organizations that routinely host extremist speakers and espouse radical views, and which have all built partnerships with Erdoğan and his government. At the most recent MAS-ICNA convention—an annual joint Islamist event organized by both the Muslim American Society and the Islamic Circle of North America—Erdoğan prepared a special video messagethat was broadcast on the main stage. The conference also featured in-person speeches by Mehdi Eker, deputy chair of Erdoğan's AKP Party as well as TASC co-chair, Halil Mutlu. Other sponsors of the Jerusalem protests included the Hamas–linked group American Muslims for Palestine (AMP), which also employs the same wording about a "Muslim red line" on Jerusalem that Erdoğan uses. In 2010, AMP publically called on its supporters to buy Turkish products as a means to protest Israel. All of these American Islamist groups work under the umbrella of the US Council of Muslim Organizations (USCMO), the main organizer of the protests in Washington. USCMO with the Turkish government. It has denied the Armenian genocide, and sent staff, including its Secretary-General Oussama Jammal, to visit AKP offices in Turkey. Jammal has also curried Turkish favor by encouraging Turkey to invade Iraq under the pretext of liberating Mosul from the Islamic State of Iraq and Syria. American Islamists, it seems, now serve a Turkish agenda. Critics claimed that the United States and Israel were destabilizing the peace process and the region by recognizing Jerusalem moving the American embassy. However, with relative quiet in the Palestinian Territories, it seems that it is Ankara, not Jerusalem nor Washington, that is fanning the flames of extremism.